With more and more people using Android phones and tablets, enjoying movies and videos or listening music on Android has become more common than ever. Having problems keeping up with your unique music demands, or have a tune from a movie trailer that is humming in your ears? Video to Audio Converter for Android should be what you need. 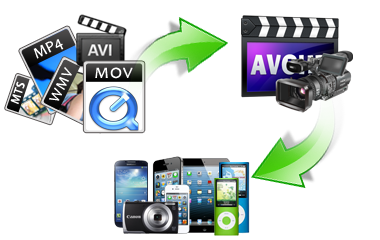 There are various Android Videos Converters are available on Internet that can convert videos in almost every format. In this post, we will introduce top three Android Video Converter for you. Any Video Converter Freeware is a totally free android video converter for you to convert all kinds of video/audio formats, including MOV, M2TS, OGM, RMVB, RM, WMV, QT, FLV, MOD, TS, TP, DVR-MS, Divx, etc. to AVI, WMV, MP4, MPEG-1, MPEG-2, FLV, SWF, MKV, 3GP and 3G2 to all kinds of portable media players including iPod, iPhone, PSP, PS3; Android products and Microsoft products. Freemake Video Converter supports all popular and rare formats: MP4, AVI, MKV, WMV, MP3, DVD, 3GP, SWF, FLV, HD, MOV, RM, QT, Divx, Xvid, TS, MTS, Fraps, etc, which can convert videos/audios to MP4, MP3, AVI, MKV, iPhone, Android. ✔ Encode videos to Flash FLV, SWF or HTML5 video formats: H.264, WebM, VP8. ✔ Send your videos, DVDs, photos or music to YouTube directly from desktop. WinX HD Video Converter Deluxe, all-in-one video software as an Ultra HD video converter, online (YouTube) video downloader, slideshow maker and video editor, gives you an ultimate control over any SD, HD and 4K resolution video files on PC. With hardware acceleration tech, it enables multiple CPU cores to simultaneously use QSV and CUDA/NVENC to encode and decode videos, which helps you convert video in a flash for Android devices! Simply free download those three above-mentioned Video Converter for Android to have a try and choose the one you prefer to get started to convert videos, audios for to your Android!